It has been a memorable year to date for Rory Beggan - and it's set to perhaps get even better. The country's top goalkeeper helped Monaghan to reach the All-Ireland semi-finals before pocketing a county championship medal with Scotstown and then landing an All-Star award. 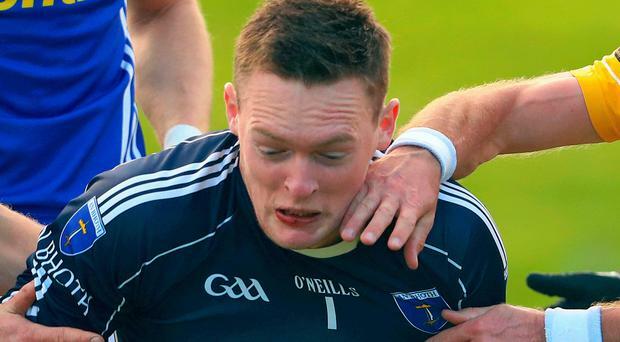 Now the 26-year-old full-time GAA coach is focused on an Ulster club championship medal following his conversion of a last-gasp long-range free that saw Scotstown edge out gallant Eoghan Rua, Coleraine in this high-octane semi-final. "When I got that last chance, I tried to compose myself, judge the wind and then just hope for the best," he smiled. "I might have got the winning point but the boys all put in a huge effort especially in the closing stages. While it's great to get personal accolades at county level, it's also extremely satisfying to share in victories such as this with your club colleagues." Eoghan Rua unleashed their familiar drive, energy and cohesion that sustained them for lengthy spells but they were eventually brought to their knees when Scotstown scored the last four points of the game. Scotstown's flamboyant start saw them sweep into a 1-2 to 0-1 lead by the 12th minute, Conor McCarthy's superb goal being complemented by points from Kieran Hughes and Rory Beggan. But just when Scotstown looked as if they might take control, Ciaran Mullan barged through to thump home a spectacular goal for Eoghan Rua goal that emphasised the team's resilience and spirit. And the Coleraine side slipped into an even more comfortable groove when Ruairi Rooney, Declan Mullan and Gavin McWilliams hit points. Eoghan Rua maintained their momentum with McWilliams and Barry Daly from a free hoisting them into a 1-7 to 1-6 interval lead, ad advantage that had looked improbable given Scottown's earlier dominance. And when Ruairi Mooney cracked in the Derry champions' second goal with just six minutes of the second half gone, a place in the final looked like becoming a reality. But an injury to Niall Holly, a failure to convert two goal chances and a brace of points from Francis Maguire and Kieran Hughes combined to herald the start of Coleraine's exit. This series of events led to Eoghan Rua surrendering the authority and composure they had shown and instead forced them onto the back foot. Declan Mullan and Barry McGoldrick managed to fire over two more points but, crucially, Scotstown scored the last four points of the game through Maguire, Rory O'Toole, Damian McArdle and of course the ice-cool Beggan, to book their passport into the final. For Eoghan Rua, defeat was a bitter pill to have to swallow after they had shown considerable enterprise and courage. But their in ability to last the pace and cope with Scotstown's late attacking forays when they stretched the Coleraine defence to the limit before maximising the late chances that came their way underlined their experience, craft and hunger. Their Ulster club championship final against Gaoth Dobhair could well prove a meeting of the irresistible force and the immovable object in a sporting context. Eoghan Rua: R McGeough; C Lagan, L McGoldrick, B Daly 0-1; C Mullan 1-0, B McGoldrick 0-1 C Lenehan; N Holly, M McTaggart; R Mooney 1-1, S L McGoldrick, G McWilliams 0-2 (1f); D Mullan 0-4, Colm McGoldrick 0-1, Ciaran McGoldrick. Subs: R McCarey for Holly (41). Scotstown: R Beggan 0-2 (1f, 1'45'); B Boylan, R O'Toole 0-1, D McArdle 0-2; J McDevitt, D Morgan, E Caulfield; F Caulfield, K Hughes 0-3; F Maguire 0-2 (1f), C McCarthy 1-1, J McCarey; S Carey 0-2 (1f), D Hughes 0-1, O Heaphy. Subs: C Forde for Heaphy (36), P Sherlock for McCarey (48), J Hamill for F Caulfield (54). By Michael Smyth Belfast's Blessed Trinity College have qualified for the Danske Bank Ulster Schools' GAA Brother Nolan Cup Final for the first time in the school's short history. By John Campbell There is simply no stopping Slaughtneil camogie scoring ace Tina Hannon when it comes to the pursuit of success. By John Campbell He may be Derry's longest-serving current player, but Enda Lynn fully intends to bring the zest and enthusiasm of a teenager to the Ulster Championship stage.